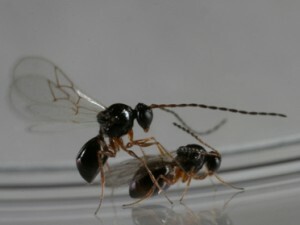 We sequenced the complete genomes of a sexual and an asexual lineage of this parasitoid wasp. The latter are asexual because they are infected by a parthenogenesis-inducing bacteria (Wolbachia). This infection became established roughly 100,000 years ago. The comparison of the two genomes provides insight into the genomic consequences of asexual reproduction. In particular, we are interested in the accumulation of mutations and the associated decay of genes in asexuals. The results are currently being written up for publication. Kraaijeveld K, Zwanenburg B, Hubert B, Vieira C, de Pater S, van Alphen JJM, den Dunnen JT & de Knijff P 2012 Transposon proliferation in an asexual wasp. Molecular Ecology 21: 3898-3906.